An assured appearance between the sticks for Steer who continue’s to cement his place as no.2 to Sam Johnstone. Following up from a Man Of The Match performance in the previous round against Colchester, Steer pulled off a fine save to deny Wigan a second goal in the closing stages. A really good performance from the Belgian who is still looking to regain match sharpness after a long layoff. In a defence featuring youth, de Laet cut a mature figure, tidying up bits of play and calmly playing the ball out on a number of occasions. Came to Elphick’s rescue in the second half, covering for his partner’s error. A good performance, demonstrating his worth at both full-back and centre half for the season ahead. Too casual at times and was incredibly lucky in the second half to not see his dispossession result in a chance. Played reasonably well overall, but also did opt for at least two speculative efforts rather than picking better placed team-mates. A very composed display from the youngster. Quietly went about his business all night and was unlucky not to see a long range effort find the bottom corner in the first half. Birkir displayed some of the annoying traits that are coming to frustrate fans (passing out of play, over-hitting balls, losing possession) but work tirelessly all evening. Bjarnason often finds himself in dangerous positions and was rewarded with a goal for his efforts. Had a great chance to get a Brace but a flicked header could only find the keeper. Work very hard, running the channels until the end; hopefully this game will make him sharper. Top performance from the January recruit from Barnsley. Whilst amongst the youngest on the pitch, you’d be hard pressed to spot it. Bree has a maturity about his play that inspire’s great confidence for his future at Villa Park. Contributed some bite to the back line and played the ball out with ease on a number of occasions. Very promising. A debut Man of the Match performance from the midfielder who really caught the eye. Commanding the middle of the pitch, Doyle-Hayes impressed with countless interceptions, released the ball cleverly and always looked to put Villa on the front foot. His performance will also be recalled for relentless harrying of the opposition & his efforts were rewarded with a standing ovation when withdrawn with 10 minutes to go. Huge potential if nurtured properly. A welcome return to Villa Park following a long period recuperating from injury & getting back to match fitness. A really under-whelming showing from the midfielder widely expected to depart Villa Park before the window closes. Struggled to impose himself upon the game & his impact stood in stark contrast to that of Doyle-Hayes. Gardner unfortunately can no longer trade off the notion that he’s an ‘up and comer’ or a ‘prospect’, at 25, the jury has long since finished deliberating. Another dangerous, if at times erratic performance from Albert. Adomah had far too much for Wigan to cope with and enjoyed the freedom to attack and create chances all evening. Scored a fine instinctive volley into the top corner and provided a great assist to Hogan. A professional job. Another impressive display for the U23 graduate who caught the eye against Colchester. O’Hare has bags of skill and couples this to thoughtful, quick passing moves. His instinct, like many of the younger players featuring, was to get the ball forward quickly. Another promising display. Ross has a good quarter of an hour, displaying some neat touches and linked the play very well. He did nothing to harm his chances of being considered, showing a willingness to get involved in the play and moving in the space to good effect. Looked decidedly lacking in terms of match fitness however, but only game-time can help alleviate that. A really good display from Hogan, who ran himself into the ground across both halves. His reward was two deserved goals. The first a sliding finish, the second, a superb spin and strike beyond the keeper. As is often remarked, his movement is good, but he can sometimes be guilty (like many) of over-running the ball. With that said, a constant runner and never gave the defence a moments peace. A late cameo for the England U19 winner. A good close up inspection over ten minutes cannot tell the whole story, but his height certainly gives him presence. A diving headed save also save a certain goal for the visitors in the dying moments, an illustration again of the potential in the ranks. RATED: Brighton Bossed – Aston Villa Player Ratings. Half-Time – Player Ratings: Aston Villa 1-2 Hull – Highs & Lows. Established in 2011 - The Villa Underground is an independent Aston Villa social-blog & website. Featuring pre-match discussion, post match reaction, opinion, satire, a podcast, news & social media comment on all matters affecting AVFC. Think your assessment of Gardener is very harsh, I can’t see how any player tonight deserved a 4, he was easily a 7 won balls in the air and on the ground and showed a decent range of passing. Find out how & where to listen. Villa Player Ratings: Aston Villa 1-0 Millwall – A record breaking 10 straight wins. Team News: Aston Villa v Millwall – Smith names strong side to hit 10x wins. Match Preview: Aston Villa v Millwall – TEN straight wins?? Match Preview: Bolton v Aston Villa – Smith seeks NINE consecutive victories. Redemption for Kodjia! Good Villa goal, great time to score. Respect The Ref? Bristol City players’ reaction to Scott Duncan’s penalty award. Watch: The Holte End view of Tammy Abraham’s penalty against Bristol City. 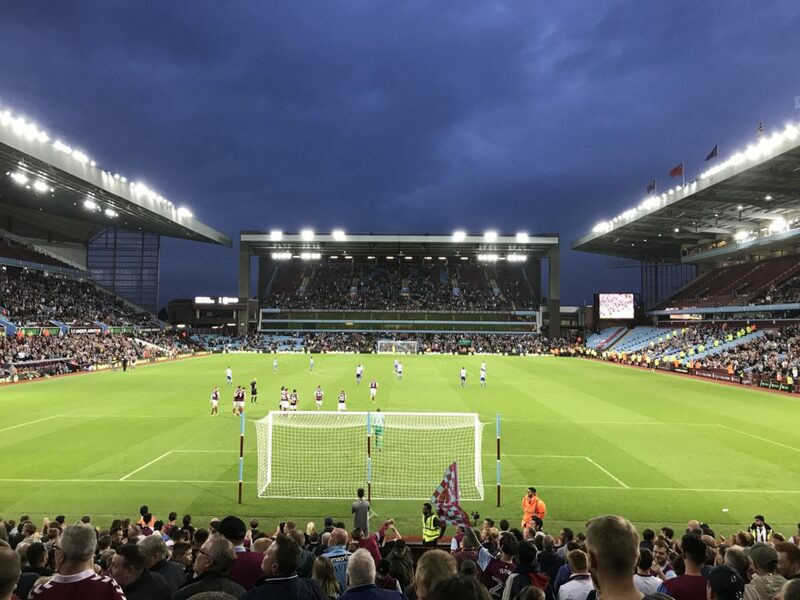 Hear a capacity Holte End in full voice for Villa against Bristol City. Watch: Rotherham 1-2 Aston Villa – Kodjia penalty & Grealish strike make it Se7en. FT: Sheff Wed 1-3 Aston Villa – Watch McGinn, Adomah & Tammy goals & Steer penalty save. HT: Sheffield Wednesday 1-1 Aston Villa – Watch: First Half Goals & Highlights.